This Lean In for introverts empowers women who may not be the loudest and most assertive people in the room to lead on their own terms. Our culture tells us that in order to succeed at work and in life, we need to be vocal, assertive leaders; but a strong team requires multiple perspectives and personality types--even, or especially, the ones that often go under the radar. In this deeply relatable book, Rebecca Holman shares research and her own hard-won experiences to empower other introvert women to harness their strengths, rather than conform to a one-size-fits-all template of success. Quiet Girls Can Run the World shows introverts how to lead in ways that come naturally--by nurturing the talents of others, taking the time to reflect before making a decision, exercising emotional intelligence, and leaving egos at the door. In highlighting the power of "quiet" qualities, Holman also encourages us to push outside our comfort zones so we can stand our ground in expressing our views, work well with those who have different personalities, and bring our A game to each public speaking opportunity. Rebecca Holman is the editorial director of Grazia online. Previously, she was the editor of The Debrief, an award-winning website for millenial women. Based in London, Holman has been a columnist for the Telegraph's "Wonder Women" section and has written about dating, relationships, lifestyle, and pop culture for Grazia, Red, Psychologies, Marie Claire Australia, and Stella. "Holman makes a persuasive case that success isn’t reserved for the Alphas. Betas—considered, relational, believers in balance—are redefining women’s leadership in the workplace. From office politics to popular culture to social media, Holman shows just how much #BetaWomenRock!" "Quietly ambitious women who feel stuck at the intersection of an introverted nature and stereotypical nurture will find solace and fresh perspectives in Holman's thoughtful book." 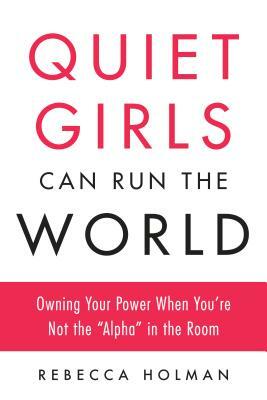 "There's more than one way to achieve success in this world, and Quiet Girls Can Run the World shows us that women who may not be the loudest or most assertive people in the room can still win—all while staying true to themselves."